It’s fun to do the singer taste test, like we did last week with Cherubino; but what about the great Conductor Taste Test? That’s when you compare recordings or performances of a passage featuring much more than one singer’s voice. Today, three contrasting takes on one of my all-time favorite moments, the end of the quartet movement embedded in Figaro’s Act 2 finale. That finale, famously, goes duet/trio/quartet/quintet/septet. 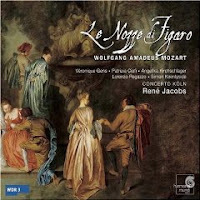 The quartet, after beginning in a bustling 3/8, settles into this gavotte-rhythm when the Count tries to interrogate Figaro about a letter casting suspicion upon the Countess. 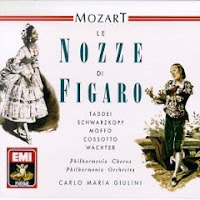 Figaro deflects the Count’s attempted gavotte just as he sidesteps his questions; he improves upon the Count’s tune and then, at the end, when they all sing simultaneously, Mozart adds a musette figure in the bass, a wondrous droning-bagpipe effect. F: Mente il ceffo, io già non mento. palesato abbiam l'arcano, non v'è nulla da ridir. S & CTA: Eh via, chetati, balordo, la burletta ha da finir. un'azion matrimoniale le faremo ora seguir. F: My face might lie, but I don't. CTA & S: Your cunning is useless here. The secret is already revealed. Give it up! CT: What do you say? F: I do not confess. S & CTA: Shut up, you blockhead. This comedy is over. we should close with a wedding. Can you make up your mind which recording to buy? Or, like most opera fanatics, do you want to hear them all? It's difficult to choose! My favorite was whichever one I was listening to at the moment. :) The Solti was beautiful, esp. the very end, but I think if I had to choose, it would be the Giulini. I like the style of the 50s and 60s (soaring, romantic?) and that the singers' voices are so distinct. I vote for the third one by Rene Jacobs! consolate i lor/miei desir" while the Count can think of nothing but his scheming ("Marcellina, Marcellina ..."). I liked the second one most of all! 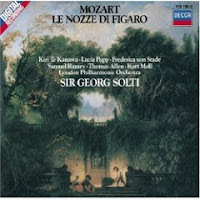 Solti is a great composer! If you can survive Battle's ridiculous accent, the sound of the Vienna horns in Muti's recording is the single greatest timbre in the entire world. Me, I still go back to Erich Kleiber's 1956 recording with Hilda Gueden as Susanna and the incomparable Lisa della Casa as the Countess. "This effect is especially wonderful when the Countess, Susanna, and Figaro sing "Deh signor, nol contrastate, consolate i lor/miei desir" while the Count can think of nothing but his scheming ("Marcellina, Marcellina ..."